Our Plant Card is our way to show you our appreciation for your business. 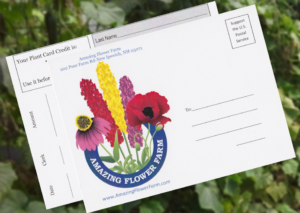 When you first come to Amazing Flower Farm each season, fill out a Plant Card, which is really a post card we will be mailing back to you. We keep the Plant Card here at the register, so you don’t ever have to worry about leaving it at home. 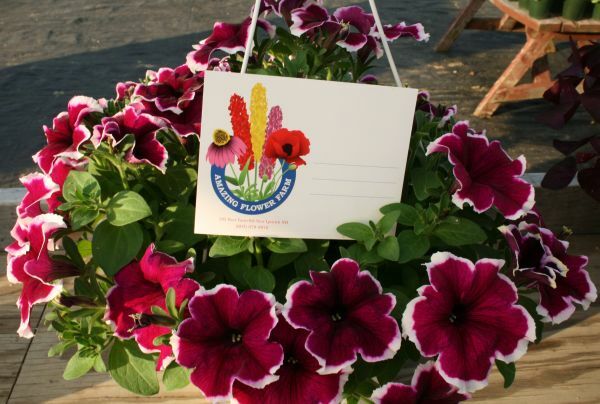 Every time you make a purchase, we write down the date and amount on your Plant Card. Before the end of our season, we tally up all the purchases and give you 12% credit. Then we mail you back your Plant Card. Bring it with you when you visit us before the end of the season, to use on any plant, shrub or tree purchase. You must use your Plant Card credit during the same growing season in which it is earned.